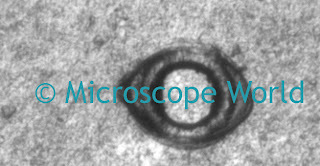 Microscope World recently had a customer that produces plastic films used for food packaging. The customer needed to evaluate the 100um size perforations in the film in order to test the strength and quality of their product. They also wanted to measure the perforations to ensure they were the correct size. This is what the perforation in the film looks like at 380x magnification. In order to capture a quality image at 380x magnification a metallurgical microscope is usually required. However, financial constraints can make this microscope out of reach for some customers. 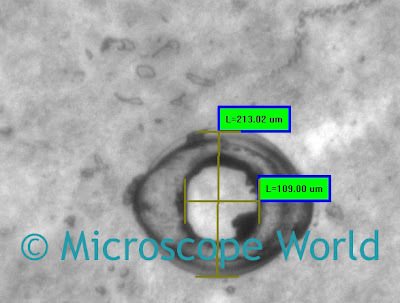 A good alternative to a metallurgical microscope is a video inspection system using a macro zoom lens. 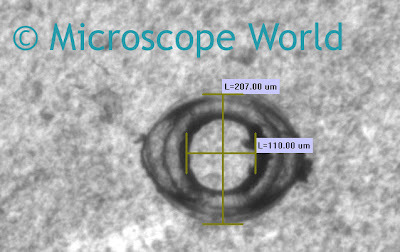 Microscope World configured a system using a macro zoom lens on a lighted post stand along with the Infinity 2-1 Monochrome microscope camera (DK1-CCD). 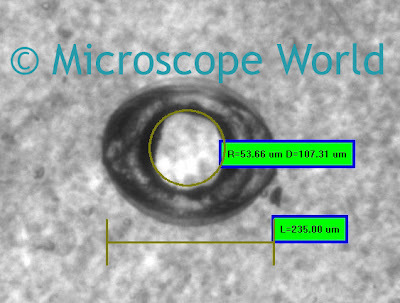 With the magnification pushed up to 380x images were captured and then the measurements shown below were made using the software provided with the camera. Measuring the perforation inner and outer distances. If you have a specific item that you need to view and make measurements, Microscope World is happy to put together a custom quote and capture images of samples prior to making a microscope purchase.